Did you know that earwax actually plays an important part in your ear’s health? When it comes to normal production, it is often best to remain hands-off. In fact, hearing health professionals deter the use of cotton swabs to remove earwax. In certain circumstances, earwax removal may become necessary, and that’s where Elite Hearing Center’s professional cerumen removal services come in. Earwax, also known as cerumen, is a combination of oil, sweat, dirt, and dead skin cells. It is naturally accumulated and produced by your body, from the apocrine gland, the same gland that produces sweat. Earwax has three main functions in your hearing health. The first function is to keep your ears clean: the stickiness traps dirt and bacteria as it passes through your outer ear to the middle ear and prevents them from entering the sensitive environment of your inner ear. The second function is to moisturize, ensuring that your ear canals and outer ears do not get dry and flaky, which could lead to irritation and infection. And the third function is to keep tiny critters such as bugs, away from your ears! In other words, earwax is your body’s natural bug repellent, as bugs do not like the smell of earwax. 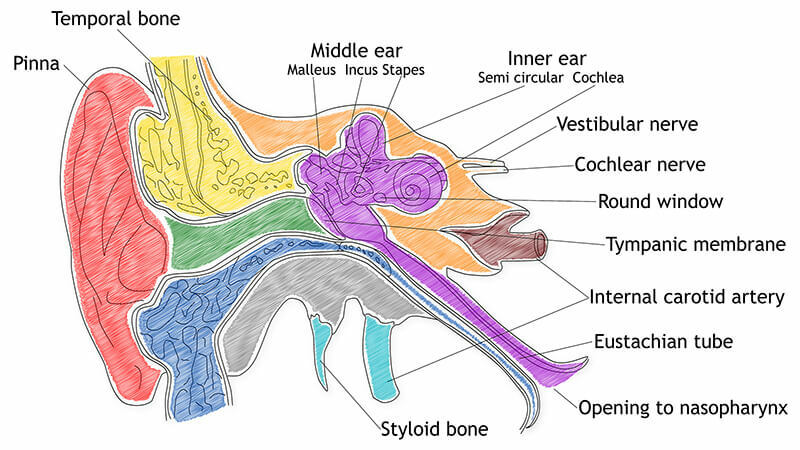 All humans produce earwax, but they differ between different populations. There are two kinds of earwax: wet and dry. Wet earwax is found in Caucasian and African populations, while dry earwax is found in Native American, Pacific Islander, and Asian populations. Earwax comes in many colors as well, ranging from light to dark. In young people, earwax is light in color. As we get older, our earwax darkens. Often, you will find that adults have dark brown or black earwax. Earwax also gets darker the more dirt and bacteria that it traps. The only time you should be alarmed about the color of your earwax is when it is tinged with red, which could signal injury or bleeding in your ear area. If you find blood in your earwax, seek medical attention immediately. Generally speaking, earwax should be left alone. We advise you not to use cotton swabs to remove it, as this usually pushes earwax deeper in your ear canal. Over time, this could lead to impacted earwax, which could interfere with your hearing abilities. Another popular method of removing earwax is ear candling. We advise you to avoid using ear candles, as they could be dangerous. Placing a flame close to your hair and face already poses a risk for burns, while the hot wax from ear candles could injure your ear canals and eardrums. So how do we get rid of earwax? For people who lead active lifestyles and have a healthy diet, earwax production is normal. Earwax is cleared by a natural process of physics in your jaw, as you eat or talk. This movement naturally expels earwax. As such, most hearing specialists will advise that you simply leave earwax alone and let your body do its own thing. However, there are instances where there may be an overproduction of cerumen. One such instance is if you tend to remove your earwax regularly. Regular earwax removal is a signal to your body to produce more earwax – which may make you want to remove the earwax, thus causing a cycle of earwax overproduction and removal! Earwax blockage could contribute to hearing loss. You may keep your ears clean by washing your outer ears with a warm washcloth. During your showers, if you let warm water trickle lightly into your ears, this could soften up and loosen earwax. If you aren’t removing your earwax regularly, but it has overproduced to the point of irritation or obstructing your hearing, then it’s time to visit us at Elite Hearing Center. Dr. Douglas Steinberg is proficient in removing earwax. He implements a variety of techniques to successfully remove earwax from an occluded ear canal. The most common method is using a curette (small tool with a looped end), which is inserted into the ear canal and removes the wax. To properly visualize the earwax within the canal, Dr. Steinberg uses a powerful light and magnification. When necessary, Dr. Steinberg also uses suction or other instruments to remove earwax. For ear wax removal Chicago area, Elite Hearing has you covered. Schedule an appointment today. If you are experiencing issues with earwax, contact us at Elite Hearing Center today to schedule an earwax removal appointment.